The brainstorming session on opportunities in Optometry was held in Surat at Bharatimaiya College of Optometry, was attended by over 70 students and 6 educators of BMCO, Hari Jyot College of Optometry (HJCO), Navasari and Nagar School of Optometry (NSO), Ahmedabad. It was ably facilitated by Mr Nilesh Thite and assisted by Ms Pradnya Gogate. The session started with a discussion on opportunities in India. With majority being final year B. Optom and M. Optom students, it was very helpful to give direction to students to plan their career. The most important aspect about optometry discussed was that it gives definite placements. A sure shot of success once after graduation, with also opportunities of working in more than one sector within optometry. A student has freedom to experiment with creativity and innovations within the boundary of this profession. Though majority of the students did not consider optometry as their first preference, they now felt it was the best decision they could make. On being asked about what the students preferred to do after graduation, most of them wanted to go into the clinical aspect of optometry. Optical practice was the next best choice followed by research and academics. This was explained during the first session, along with its pros and cons and the prerequisites required taking it up as a career option. At the end of the first session, every student had a clear picture of what all they could do as an optometrist. The second session was all about the process of goal setting. Simply having a goal without a plan is just a wish, and a wish is not always fulfilled. Beginning with the process of goal setting one must always write their goals down. Writing something increases commitment. It gives you a direction and path to follow. The third session was about the benefits of contact lens practice. The advantages and disadvantages of it were discussed. The solutions to the challenges in practice were discussed. Proactive recommendations, proper check-up, charging professional fees and educating patients were among the solutions discussed. The next session was all about building your own brand. Building your own brand means building your own attribute, making yourself known. In the field of optometry, making connections and networking is as important as any other skill you possess. Standing out of the crowd will bring you even better opportunities and will guide you through success. The importance and Do’s and Dont’s of social media in professional life were explained. It was quite an eye opener for the students. The last session brought out all the creative minds of the students. We all talk about making the profession known, but how we could, was discussed in form of group presentations. Each group was told to note down ways on how to spread optometry awareness. The best five points that were agreed upon and were selected to be implemented then on were Social media. The trend of a hash tag was to begin. #OPTOMETRY would be used to post something related to optometry, to keep it trending on 23rd of every month. The use of print media, articles related to eye care would be printed in local newspapers and health magazines. It was decided to encourage volunteers to coordinate this activity in different areas and contribute articles. Each optometrist should use merchandise in forms of name plates, apron and logos. The suffix, Optom should be used regularly. Educating counsellors and those who play a role to educate students about career opportunities was the next action point. 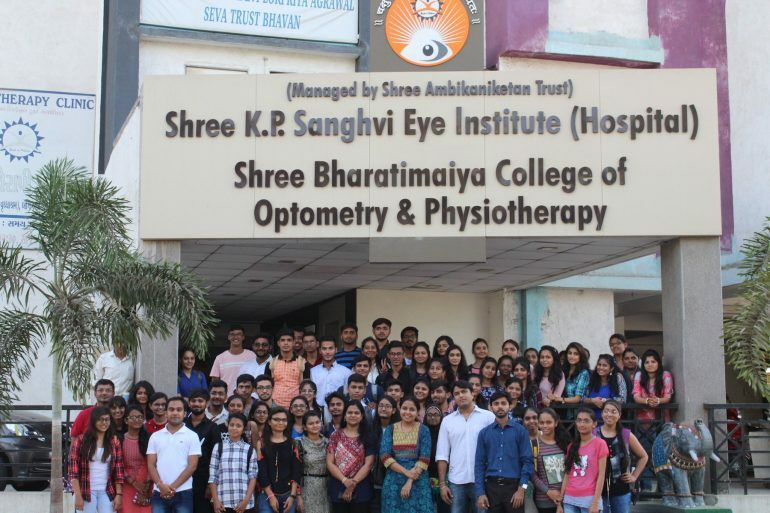 Finally, it was also decided to be a part of various social gatherings and educate them about eye care and Optometry as a primary eye care profession..
At the end of the day, everybody came out with a big smile and a mission to work for optometry. Every student was given direction and a solution to all the confusions created on what to do after graduation. Such two way interaction among students and teachers was appreciated by all the attendees.